Glen James, of Boston, left, smiles in the direction of members of the media as Boston Police Commissioner Edward Davis, right, looks on during a news conference at the police headquarters, in Boston on Monday, Sept. 16, 2013. James, who is homeless, turned in a backpack containing $2,400 in U.S. currency, almost $40,000 in traveler's checks, as well as Chinese passports and other personal papers to police after finding the items in a Boston mall late Saturday. A homeless Boston man who police said turned in a backpack containing tens of thousands of dollars in cash and traveler's checks said even if he were desperate he wouldn't have kept "even a penny." 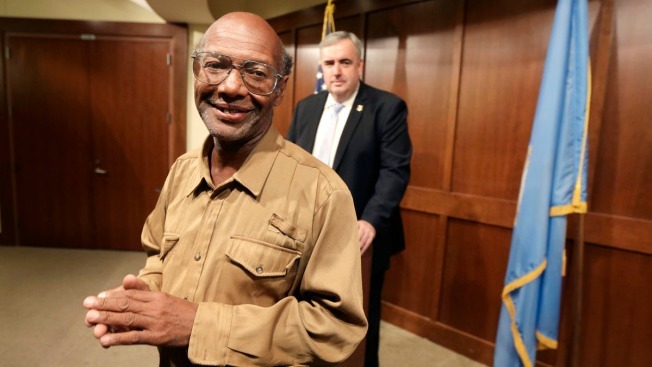 Boston Police Commissioner Edward Davis honored Glen James on Monday, giving him a special citation and thanking him for an "extraordinary show of character and honesty." James said in a handwritten statement he gave out at a news conference that he was glad to make sure the bag and its contents were returned to the owner. "Even if I were desperate for money, I would not have kept even a penny," he said. James, who said he once worked as a Boston courthouse employee, found the backpack at the South Bay Mall in the city's Dorchester neighborhood Saturday evening. He flagged down a police officer and handed it over. Inside the backpack was $2,400 in U.S. currency, almost $40,000 in traveler's checks, Chinese passports and other personal papers. The man who lost it told workers at a nearby Best Buy store at the mall and they called police. Officers then brought the backpack's owner to a nearby police station and returned his property after confirming it belonged to him. Authorities said that the backpack's owner didn't want his identity made public, but that he was a Chinese student who was visiting another student in Boston. James, who didn't give his age, said he is from the Boston area and has been homeless since 2005. A police spokeswoman said authorities don't know his age either, but said that James is staying at a city homeless shelter and that many people have expressed interest in helping him since hearing about his good deed. The Good Samaritan said in his statement that he worked as a file clerk in the Boston municipal court system for 13 years, but lost his job and became homeless after problems with his boss. James said it would be difficult for him to hold down a job because he suffers from Meniere's disease, which the Mayo Clinic describes as an inner ear disorder that causes episodes of vertigo. James said that he doesn't want to be a burden to his relatives and that people at the shelter help him. He said God has always looked after him. James gets food stamps and panhandles to make money to do laundry, to pay for transportation and buy other "odds and ends," he said. On Monday, he also thanked the strangers who have given him spare change on the street. "It's just nice to have some money in one's pocket so that as a homeless man I don't feel absolutely broke all the time," he said.